The Organizer: Can you give us an update on the immigrant rights situation across the country and what activists are doing to counter the growing attacks? E.J. Esperanza: Arrests of undocumented immigrants are up 40% since the Trump administration took office. This is on the back of approximately 3 million people deported under the Obama administration. Notably, there’s been a 218% increase in the arrest of people with no criminal records whatsoever. For the most part, these are people who have been in the United States at least a decade. Many have been here up to 30 years. In addition to increasing enforcement, the Trump administration, taking its lead from Stephen Miller and other white supremacists, has set out to implement a program of ethnic cleansing. Trump’s program of ethnic cleansing began at the border. First, Trump enacted the Muslim ban, which was aimed at preventing green-card holders and visa holders — that is, people who were coming to the United States legally —from entering the country. The Supreme Court has upheld a slightly watered-down version of the Muslim ban. It’s a version that seeks to prevent refugees from Muslim countries from entering the United States. These are refugees from countries in the Middle East that have been the victims of U.S. wars for oil and profit, countries that have been subjected to endless bombings and the devastation of their basic infrastructures. Trump has also limited asylum for refugees from Central America; countries that have been ravaged by U.S. economic and military intervention that has displaced millions of people. People entering from the southern border are being turned around by Customs and Border Protection (CBP) and told they can no longer apply for asylum — even though they have that right. Attorneys and organizers are working round the clock to ensure that people’s rights to asylum are protected. The Trump administration isn’t only targeting refugees and asylum seekers, but all immigrants of color, including those with lawful status. In the interior, the Trump administration is achieving this by increasing the classes of people who are at risk of deportation. It began with the decision to revoke Deferred Action for Childhood Arrivals. We are talking about nearly 1 million undocumented youth who had obtained lawful presence after years of mobilizing and pressuring the Obama administration to halt deportations. That’s nearly 1 million immigrant youth on the radar of ICE and the Department of Homeland Security. Already, DACA recipients have been arrested by ICE, placed in detention centers, and put into deportation proceedings. While mass protests by DACA recipients and the intervention of attorneys have enjoined the Trump administration from ending the DACA program, DACA is on a short time line. The Trump administration also revoked the Temporary Protective Status (TPS) of hundreds of thousands of people from Honduras, Haiti, and El Salvador who were in the U.S. lawfully. This has increased the pool of people who are now targeted for detention and deportation — people who were formerly lawfully present. But the Trump administration is not stopping there. It’s coming after citizens, too. Most notably, the Trump administration is now enacting policies aimed at “denaturalizing” people who are already citizens. The goal is to revoke their U.S. citizenship. These are foreign nationals who became citizens through legal measures. Once these denaturalization policies are enacted, the U.S. immigration services will be instructed to look over the naturalization applications of people from Latin America, Africa, and Asia to see if there were any minor mistakes or irregularities in their paperwork. If so, they will be at risk of being stripped of their citizenship and at risk for deportation. There’s also been an increase in the deportation of immigrants from Vietnam and Cambodia. We are talking here about hundreds of thousands of refugees who were displaced by the heinous U.S. war in Southeast Asia. These refugees have been here since the 1970s. Many arrived here as children. They are people who for decades have been complying with immigration laws and reporting yearly to immigration authorities. They are being apprehended at their reporting dates, detained, and flown back to Vietnam and Cambodia. The reason this is happening now is that the Trump administration has forced countries to repatriate nationals to their countries of origin. The Trump administration is withdrawing aid and putting economic pressure on these countries to take back people who have been in the United States for decades. It’s been able to obtain new repatriation agreements with Vietnam and Cambodia. Here in California there have been efforts to keep these families in the United States by organizing campaigns that will allow them to seek and obtain sanctuary. So when we talk about immigrant rights, it’s not just a question of undocumented people; it’s a question of basically anyone who isn’t white in the United States. What’s at work is a program of ethnic cleansing that is emboldening the right-wing extremists to heighten their attacks against immigrants, be they citizens, refugees, or undocumented. It’s a program, moreover, that is being used as a divide-and-conquer tactic against the working class as a whole. The Organizer: How is the immigrant rights movement fighting back against these attacks? E.J. Esperanza: The movement is responding on many levels. In addition to the organizing on the border to ensure compliance with asylum law, a new grassroots movement is emerging in schools, neighborhoods, and churches across the country. It is organized in neighborhood committees called rapid response networks. Over 25 cities nationwide currently have these networks. These networks have established 24/7 hotlines for immigrants to call. Dispatchers are trained to give know-your-rights information in case ICE and DHS are apprehending someone at their workplace, home, or on the streets. These networks have trained thousands of volunteers on the ground, neighborhood by neighborhood, to do legal observation and document any violations by ICE. They also alert legal observers in the vicinity to show up, record, and protest ICE at the point of apprehension. It also must be noted that people targeted are increasingly being placed into for-profit, far-away detention facilities, often times in different states. This isolation is pushing families to the brink of poverty and homelessness. They can’t pay their rent, they face evictions, and their children are at risk of being put into the foster-care system. All this creates a sense of hopelessness; it breaks the people’s will to fight and forces them to accept deportation. This is a conscious strategy to expedite deportations by getting people to waive their right to go before a judge and find a pathway to remain in the United States. But that is not all. These immigration judges work for the Department of Justice, which is headed today by Jeff Sessions, who is no friend of immigrants or people of color. Sessions has done three things to further expedite the removal of immigrants from the United States through the courts. One: He has compromised the judicial independence of judges in the immigration courts by eroding due-process protections for immigrants and ordering judges to arbitrarily restrict asylum law for refugees. Two: He has prevented judges from granting more time for immigrants without an attorney to look for an attorney. This is not a small matter. At the rate people are being apprehended, there are simply not enough attorneys to defend clients — and under our immigration law, immigrants don’t have the right to an appointed counsel. An immigration judge has now become a deportation judge under strict orders by the Department of Justice to deport as soon as possible. Three: Sessions and the Department of Justice have issued deportation quotas for immigration judges that must be met every year. If judges don’t deport a certain number of people each year, their jobs are on the line. For rapid response committees this has been the focus of our work. We work directly with the impacted families. We are doing fundraisers to make sure that people aren’t evicted when someone is apprehended by ICE, or to pay for attorneys and bonds — and we are providing transportation for children when families are too afraid to leave their homes to take their children to school. 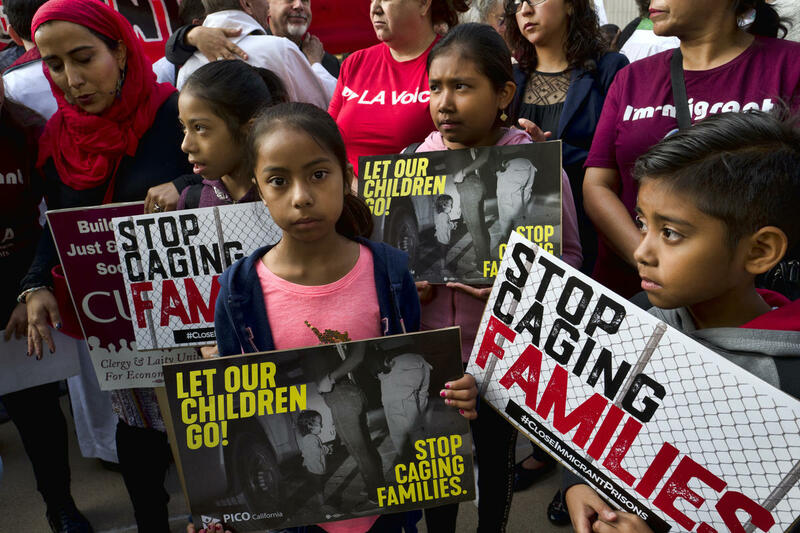 The networks are also organizing public campaigns to expose the administration’s shock doctrine against the immigrant community that is happening on a daily basis. We want to galvanize people across the country to abolish ICE and stop the deportations by exposing the repression. 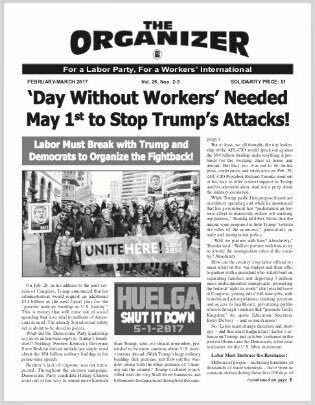 The Organizer: Are the Democrats standing up to protest this across-the-board assault on immigrants? E.J. Esperanza: No, there has been nothing substantial. The Democratic Party has been giving increased lip service during these mid-term elections to DACA and to the plight of children separated from their families at the border — mind you, family separations that started with the Obama administration. A nationwide movement has arisen to expose the issues and demand accountability — and this has made it necessary for the Democrats to pay lip service. For example, it took a bold mobilization by immigrant youth at a press conference of Nancy Pelosi to insist that Pelosi stand up squarely for all DACA recipients, and that she not sacrifice the broader immigrant communities, particularly the parents of those DACA recipients, by capitulating to Trump to fund more deportations. Something similar had to be done with Senator Feinstein. Wherever there have been statements or pushbacks, it’s because of the growing strength of the grassroots immigrant rights movement. There have been no real attempts by the Democrats to hold the Trump administration accountable, however. In terms of interior enforcement, this is an issue that politicians in Congress have paid little attention to, including the Democrats. There’s been no resistance to these policies. And this is largely because these interior enforcement policies began under the Obama administration. Nor have the Democrats spoken out against the accelerated attempts by the Trump administration to denaturalize people who have legal status in the United States. So, in our neighborhoods and workplaces, we are relying on the rapid response networks, which aim to mobilize undocumented immigrants and allies into a united-front movement that meets the needs of immigrants right now, that assists them at the point of interaction with this unjust system — at the point of arrest, family separation, and deportation — so that they are more capable of fighting back, speaking out against the injustices, packing courtrooms that are expediting deportation, demanding justice, and building larger and larger protests. 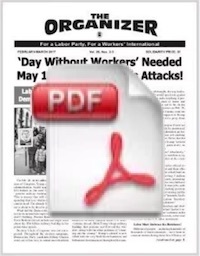 The Organizer: How can our readers get involved to help with this defense effort? E.J. Esperanza: The Immigrant Liberation Movement has been at the forefront of creating these networks and organizing the hotlines, with thousands of volunteers, and training materials for these volunteers. They have put all these tools at the disposal of local neighborhoods. Readers of The Organizer can go to immigrantliberation.com or at facebook.com/immigrantliberation/ to get more information. Donations to help fund this effort are always welcome.